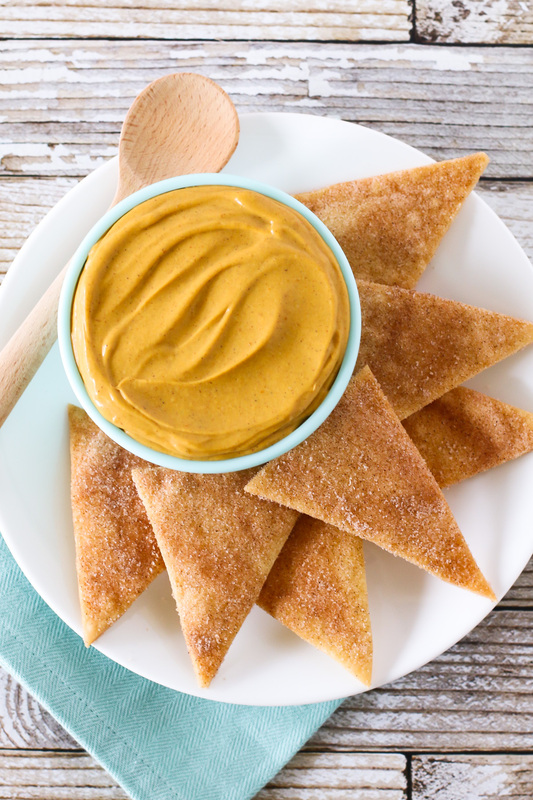 When party season hits, you need a solid recipe by your side, and these cinnamon sugar pie chips and pumpkin cheesecake dip is sure to please every crowd. Gluten free vegan cinnamon sugar pie crust chips and pumpkin cheesecake dip. A sweet little duo! With the holidays quickly approaching, our calendars are going to start filling up with parties and celebrations. I love it! It’s my favorite time of the year for so many reasons, but especially for the fun time with family and friends. It makes my heart so happy. Whenever I make a pie, I always turn the leftover pie crust scraps into cinnamon sugar chips. Simply baking the pie crust with a sprinkling of cinnamon and sugar on top. During the holiday season, I seem to be making more pies so that means even more cinnamon sugar chips! My kids love and I seriously can’t stop eating them. 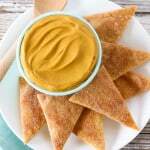 Today I’m sharing my easy-peasy recipe for pie crust chips, plus a dairy free pumpkin cheesecake dip. Dairy free cream cheese, blended with pumpkin puree, sugar and pumpkin pie spices. This is a great make ahead treat, perfect for bringing to a holiday party or get together. These cinnamon sugar pie crust chips with my gluten-free flour blend are also pretty tasty on their own. Dipped in coffee? Yep, that’s good too. Sift together flour blend, sugar and salt. Add shortening. Using pastry cutter, combine ingredients until resembles a course meal and shortening pieces are less than pea-size. Pour in 4 tablespoons cold water and vinegar. Continue to blend until dough comes together (add another tablespoon of water if needed). Place dough onto large piece of plastic wrap and top with another piece of plastic wrap. Roll out into about 1/8″ thick. Remove plastic wrap from top. Slice dough into triangles, using pizza cutter or sharp knife. Carefully place triangles onto prepared cookie sheet. Mix together cinnamon and sugar topping. Sprinkle over pie dough chips. Bake 15-20 minutes, until golden brown and crisp. Remove from oven and place onto cooling rack to cool completely. Repeat with remaining dough. In food processor or high-powered blender, add dairy free cream cheese, pumpkin, coconut sugar, maple syrup, lemon juice, cinnamon, ginger, nutmeg and vanilla. Blend on high 1-2 minutes, until smooth and creamy. Pour into airtight container and refrigerate dip 1-2 hours. Serve pumpkin cheesecake dip chilled, alongside cinnamon sugar pie crust chips. This entry was posted in Appetizers & Snacks, Baked Goods, Dairy Free, Desserts, Recipes, Recipes & Techniques by Cooks We Love, Vegan and tagged celiac disease, food allergies, gluten allergy, gluten free baking, gluten free holidays, gluten free mommy. Bookmark the permalink.